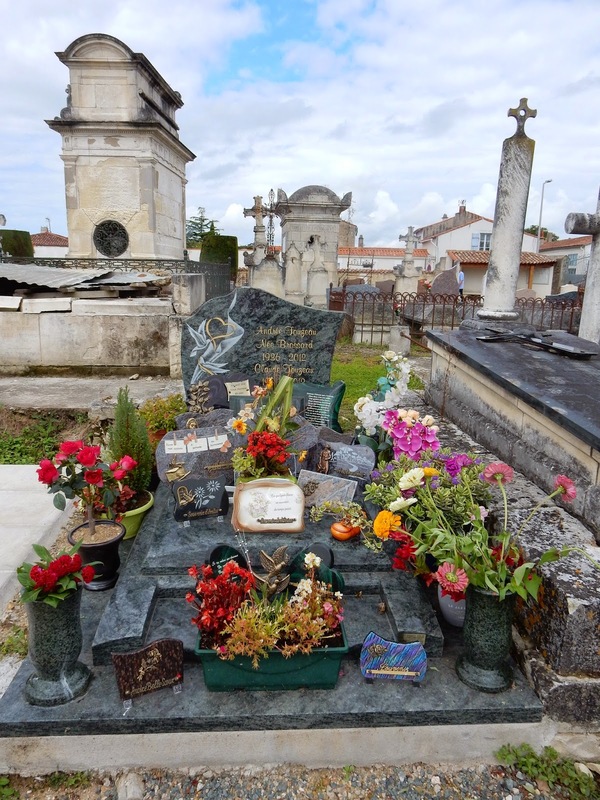 Trivia fact of the day: French gravestones are often in the shape of a single bed with a large flat area and a stone at the top, like a headboard. It is customary to leave mementoes on the flat area to honour a lost loved one. These can be real flowers, but more common are stone or ceramic pieces with inscriptions, blooms, or an image of the deceased. Some stones can get very crowded, as you can see in the photo below. 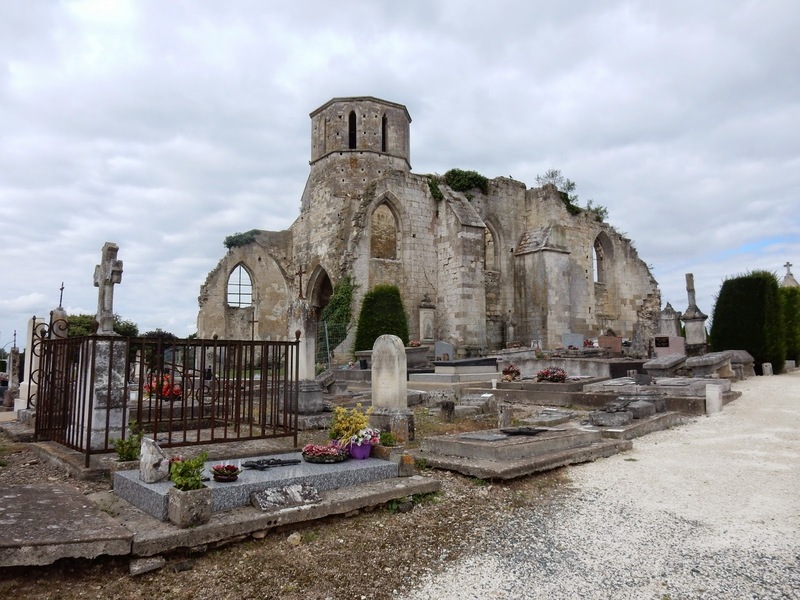 I mention this fact since our first stop on Monday was a visit to the site of l'Eglise Saint-Étienne de Marans, a shell of a church that would have been the parish of my paternal ancestor, Nicolas Fournier. He emigrated to Canada in 1664 to work as an indentured servant in Quebec City for three years before he was granted a parcel of land along the north shore of the Saint Lawrence River. When Bob and I were in the area in 2008, we made a late evening stop at this church, but it was so dark, we saw very little of it. Today, we were able to spend more time at this site. Our next stop was the village of Vouvant. There is a website called "Les Plus Beaux Villages de France" that lists these little gems, so we planned to stop at three of them today. 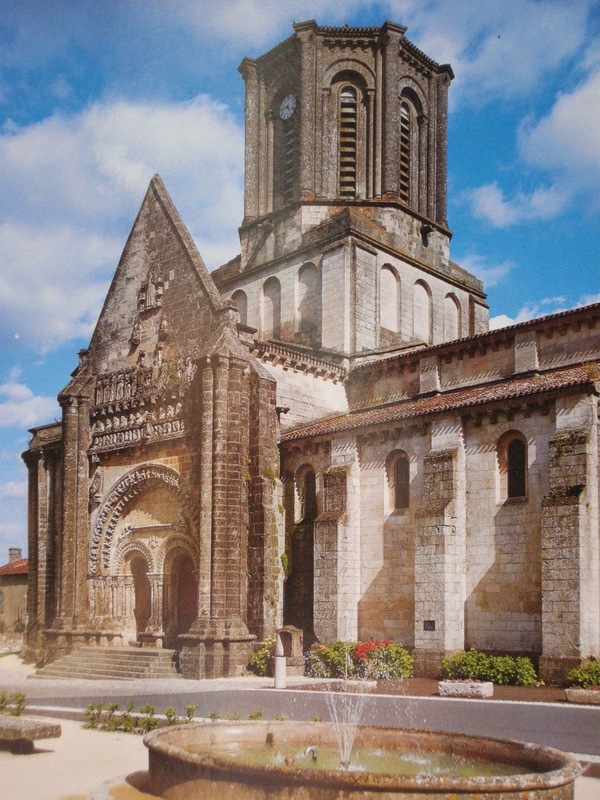 Vouvant has a well-preserved fortified wall, but its main attraction is its 11th century Romanesque Church, l'Église Notre-Dame, quite unusual in its design. The sanctuary is well above the nave, so that it would be quite difficult to see the priest from below. 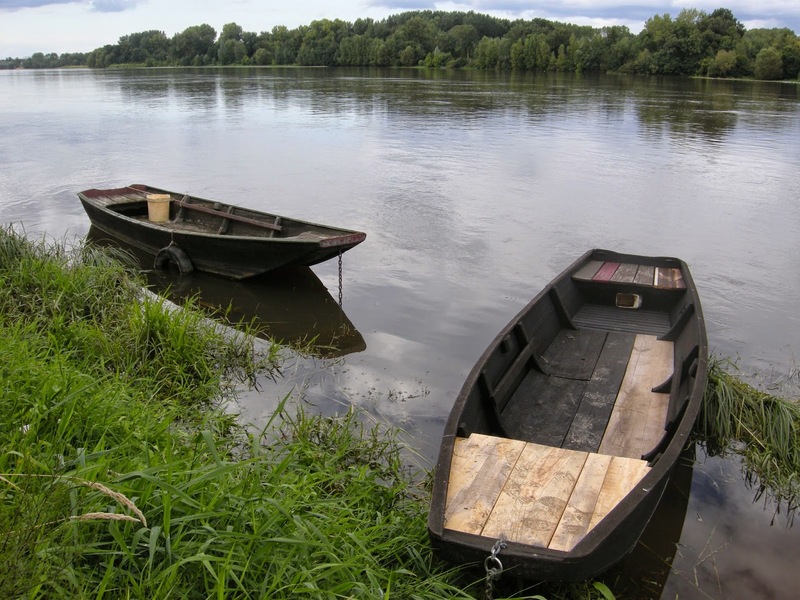 After lunch, we headed north towards the Loire River Valley. This part of France offers so many places to see, that it requires a week or two to fully appreciate the sights. But we had only a few hours to get ourselves to our destination for the night. For that reason, we chose to visit small towns, rather than some of the famous Chateaux in the region. 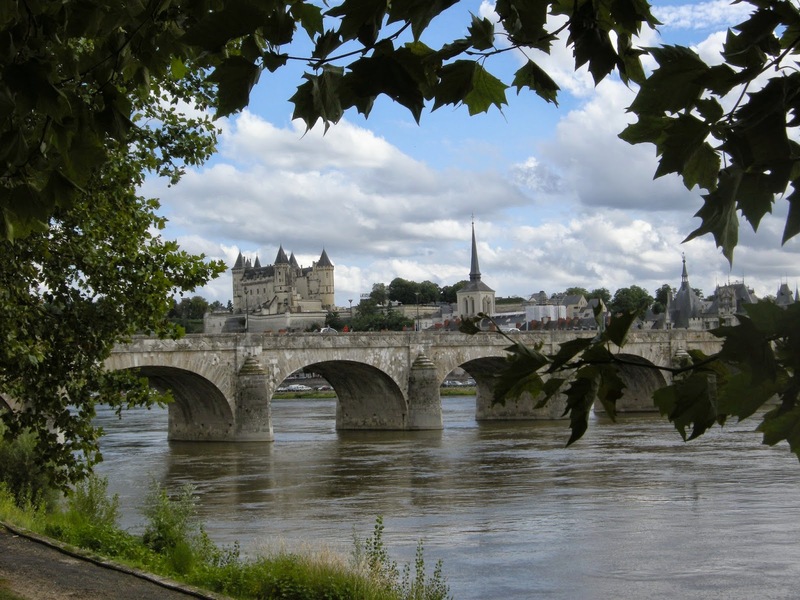 We stopped first in Saumur, but only to take a few photos across the river. Then we followed the road on the left bank to Montsoreau, a village with a castle perched above and flat-bottom boats below. Nearby, we had a quick look at Candes-Saint-Martin, our final beautiful village, before hurrying to Blois where we had a room for the night. As we headed out to dinner, we liked what we saw so much that we decided that we would take advantage of a late check-out the next day to fully appreciate what Blois has to offer. 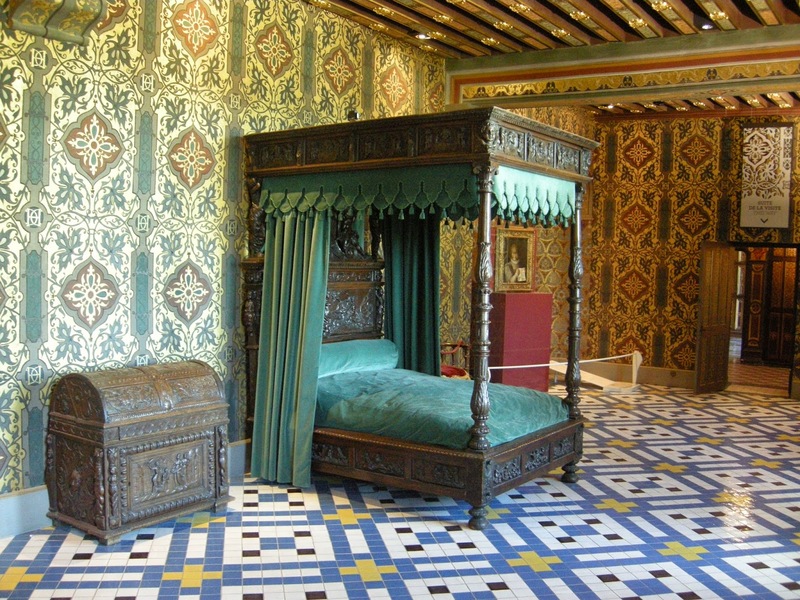 On Tuesday morning, we headed first to Le Château Royal de Blois, so called since French kings resided there at one time. It is very well worth the price of admission! 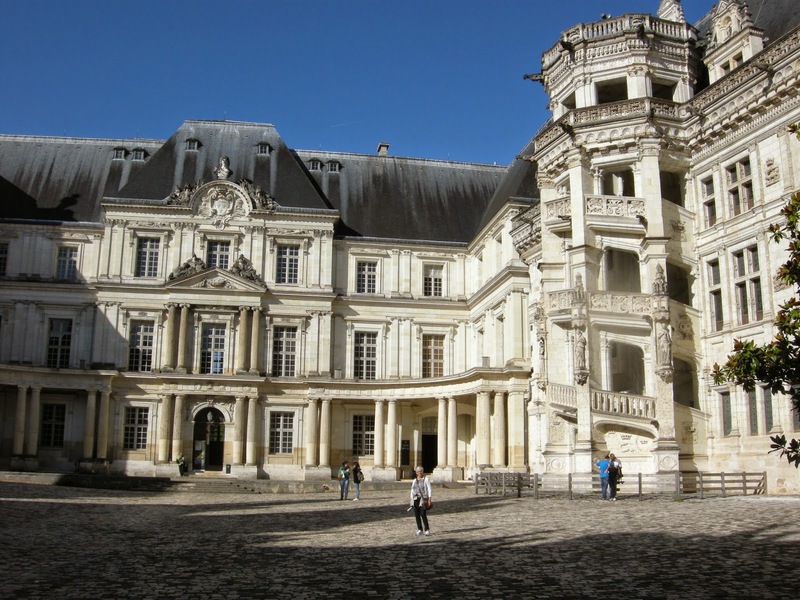 Highlights include François I's spiral staircase and Henri IV's royal chambers. 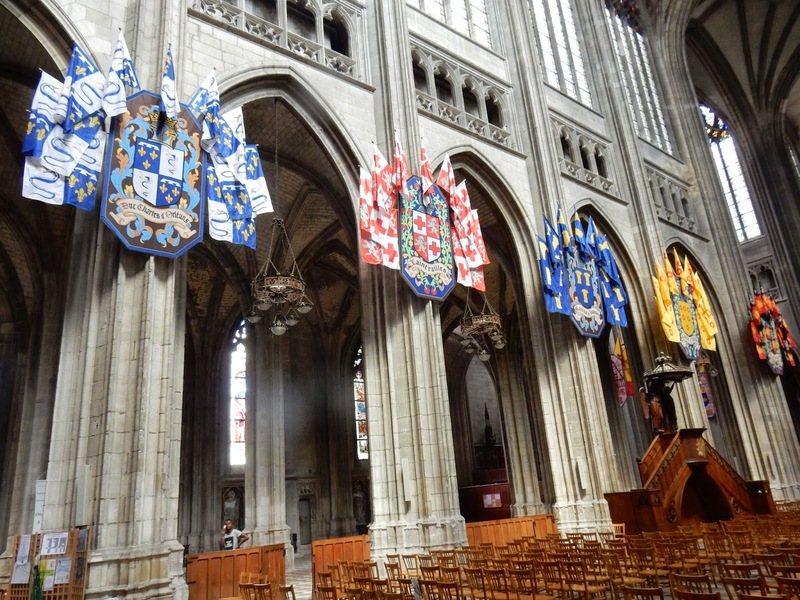 We found time after this visit to see the Cathedral Saint-Louis de Blois also. We did not know at the time that it would be the first of three cathedrals we would see that day, and, as it worked out, the least striking, although, to be fair, it had some beautiful features. 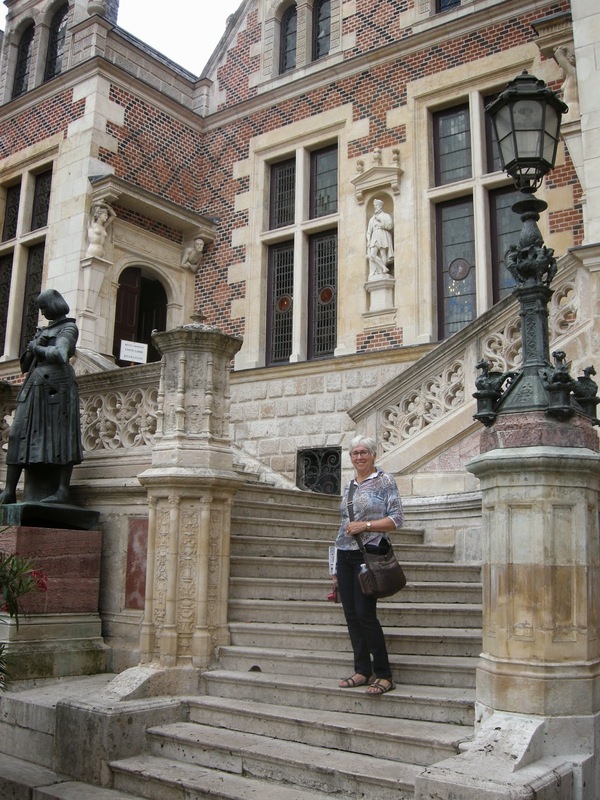 In the courtyard at Le Château Royal de Blois. The famous spiral staircase is on the right. 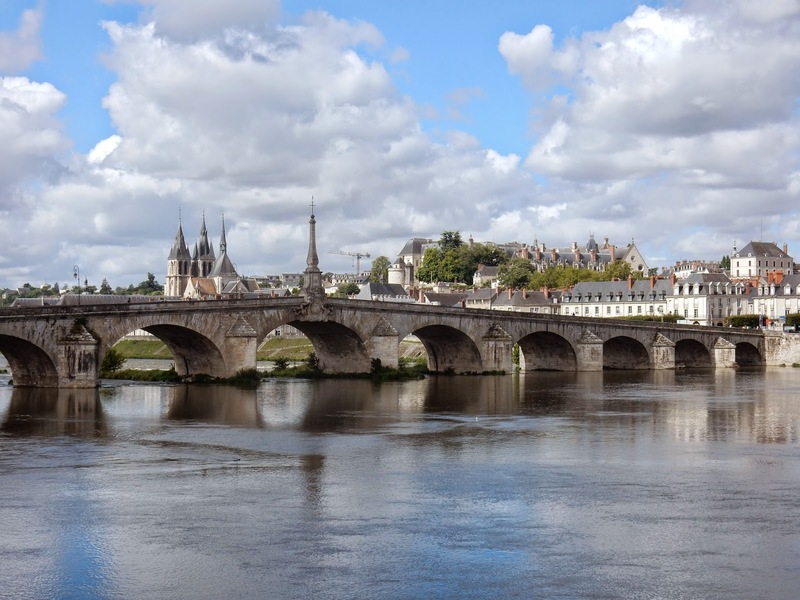 We crossed the Loire to be in a good position to capture the skyline of the city before heading east along the "rive gauche" of the Loire. Our next stop was Orléans, home of Jeanne d'Arc. She may have died centuries ago, but she is alive in her native city. 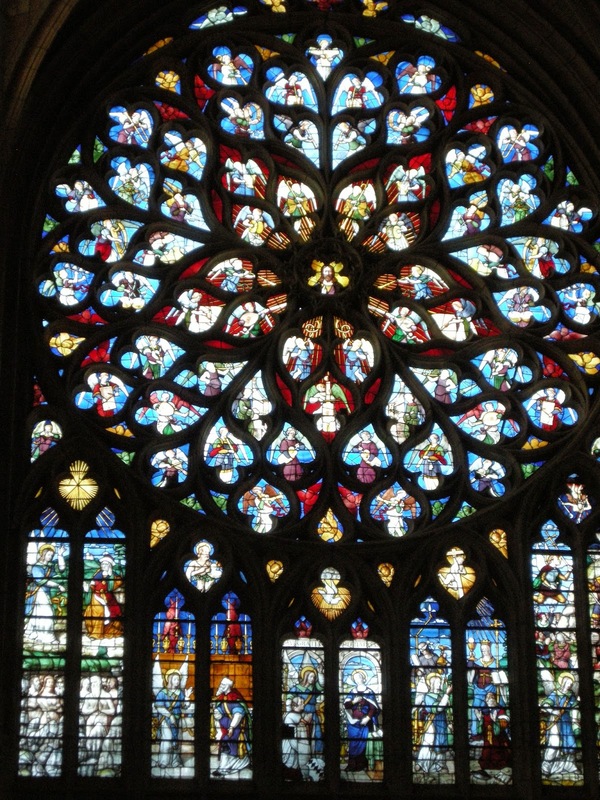 The Basilique Cathédrale Sainte-Croix d'Orléans depicts her life and martyrdom in its stained-glass windows; there is a reconstructed half-timber house on the site where she was born; and her statue sits in front of the mansion that we visited which had been used, until recently, as a city hall. Orléans is, generally, a modern city. I enjoyed its wide boulevards and shops, although, unfortunately, there was no time for shopping. 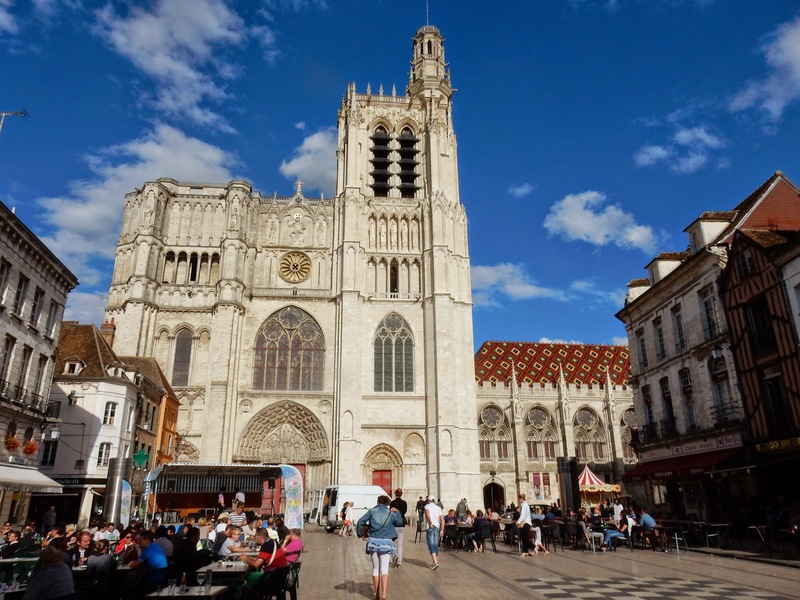 On our way to Troyes, we stopped at Sens to visit our third cathedral of the day, Le Cathédrale Saint-Etienne de Sens This is one of the earliest Gothic churches in the country; its stained-glass windows are particularly fine. We also liked the Burgundian tiles on the roof. Finally, we arrived at Troyes for the night. 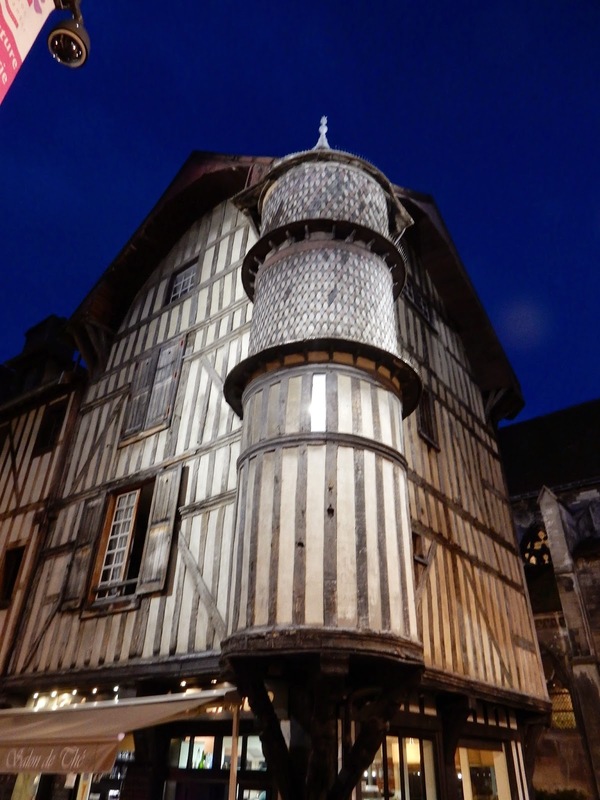 Its old quarter is full of half-timbered houses, including a tourelle which now houses a crèperie. 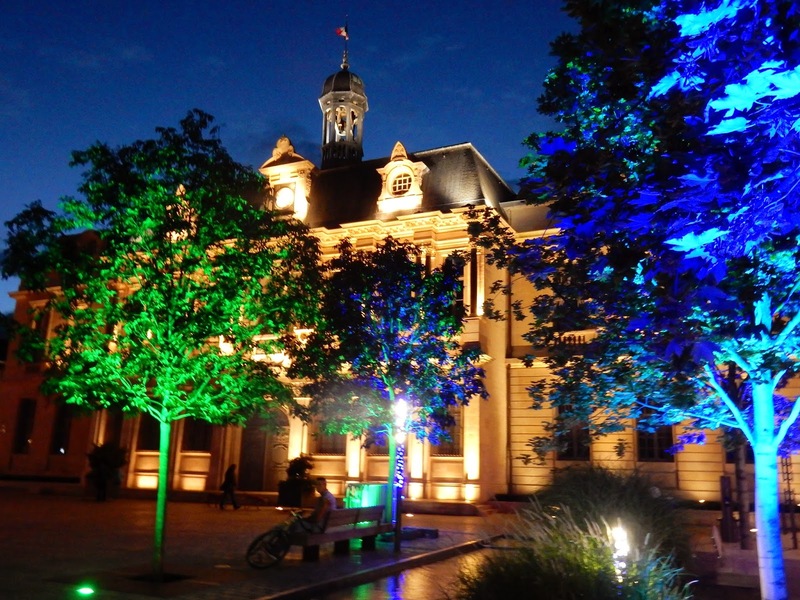 The lights on the city hall were impressive, especially in contrast to the blue and green trees alongside it.